Blue’s ArtHouse is honored to work with many non-profit organizations that are accomplishing great work in the St. Louis area. 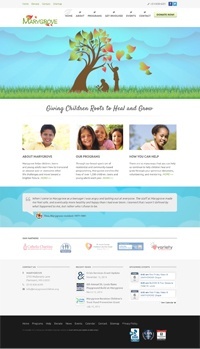 Our newest website redesign is for another amazing organization that we’ve been working with for almost a decade. Marygrove provides quality mental health services to children, young adults and their families who are economically disadvantaged. Marygrove helps children, teens and young adults learn how to transcend an abusive past or overcome other life challenges and move toward a brighter future. I am especially proud of this beautiful new website design for Marygrove which features a lovely animated version of their logo on the front page. Be sure to move your cursor over the tree image to see the neat parallax effect that makes the leaves look as though they are blowing in the wind. The website is full of interesting and surprising animations and effects that will keep visitors visually delighted on every page. Take a few moments to explore this amazing new website from Blue’s ArtHouse!